Bulgaria: Will the export-led recovery be sustained? In Bulgaria, GDP grew by 1.5% year on year in the first quarter of 2011 thanks to a continuing export boom. The unusually robust export performance contributed to a reversal in the current account balance; the latter turned positive in 2011. However, domestic demand has remained depressed, with both private consumption and fixed investment, in particular, shrinking still further in the first quarter. 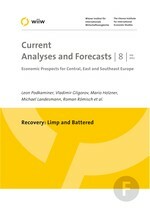 The outlook for 2011 and thereafter is moderately positive, yet uncertainties prevail with respect to the sustainability of the current export-led recovery.